Kristian Skylstad and Vibeke Tandberg present their new angles on photography. The Angle 1–90º series aims to present a variety of perspectives within photography. As one of its editor Verena Winkelmann told us in a previous interview, in the end there will be 90 books presenting a wide variety of approaches to the photographic language. What was your impression of the series and the idea behind it when you were invited to participate? Tandberg: It’s a great project, I wasn’t aware that the goal was to produce 90 books. This makes it even better. The format is special – there’s nothing like it around, and the focus on photography makes it very specific. It was an easy project to say yes to. Skylstad: I felt it was an open vessel or container, with very pure intentions, and the design of the series reflects that. I was a bit jealous of the people who’d already been invited, and I was quite ‎surprised when I was invited, because I didn't really feel that I fitted into the series, and had just recently picked up the camera again after a long pause. When Vibeke and Dag Nordbrenden were mentioned, I felt more at home with this batch, since Vibeke has been an enormous inspiration as a conceptual artist for me, and Dag is one of the few photographers who’ve kept me believing in photography in my ten-year vacation from it. This way of generating an overview slowly over time is so much more believable than these thick hardback books that are continuously being published every three or four years, where the so-called field is always being defined once and for all. I never believed in the hardback. You should never be nervous about bringing a book into the bathtub. A photograph to me isn't an object – quite the opposite really. The series operates on the premise of the images. The books are absolutely not meant to function as a catalogue for the artists. The artists are invited to make works especially for Angle. Could you tell us more about the work you've made? Tandberg: I had a very good dialogue with one of the editors, Line Bøhmer Løkken, on what would work best. She’s totally under the skin of the project, so I basically listened to her advice. In the end, we decided on a series that I was already working on that would fit the format and the concept. The work is entitled Old Man 2015 and consists of a number of photographs. It’s a rework of a series I did in 2003 titled Old Man Walking Up and Down a Staircase. The photographs are scans of my face wearing a latex mask. Skylstad: I kind of broke that premise. Originally, I wanted to show images from New York, Brussels, Copenhagen, Ithaca and Oslo, which I'd photographed on my 2mpx Blackberry Curve over a period of eight months or so. They looked like Polaroids when I printed them, but the editors found them too vague, which they probably were. (Though I'm still in love with these images, because taking them brought me back to photography.) So they asked for my Sighs series, and I gave them access to my dropbox folder with over 100 scans, including the ones that weren't shown for the show at QB Gallery last year. Their taste was quite the opposite of my curator Christian Torp's selection. When I saw the result I was shocked, and even angry, but then I realised that I either had to take full control or let it go completely. 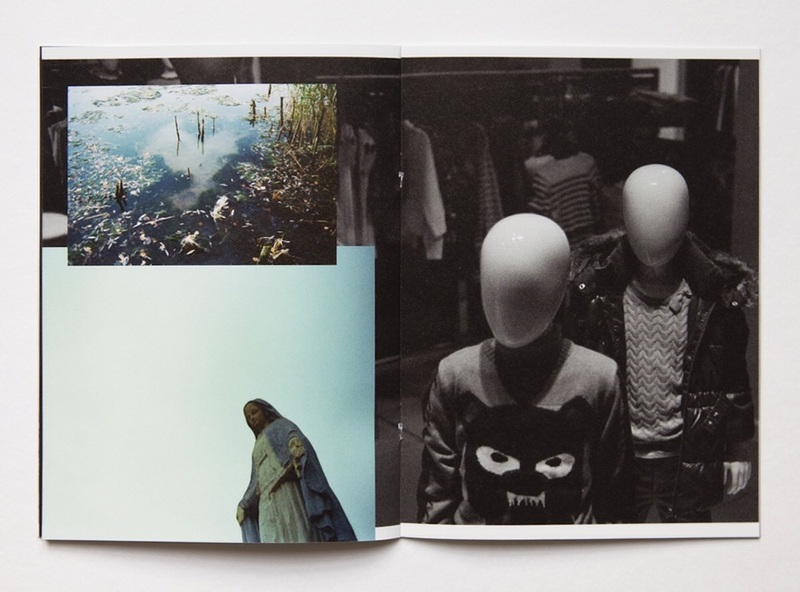 Verena Winkelmann had shuffled my images into her own narrative. I slept on it for a week. Suddenly it was hers, not mine, and that felt good. It's relieving for the soul to lose control. In our previous issue, you had a conversation about Tom Sandberg that also touched upon photographic tendencies today.Vibeke said she couldn’t see any clearly ‎defined tendencies, and Kristian only saw repetitions of previous work. What’s your view on this now, and how does Angle contribute to the photography scene today? Tandberg: I still don’t see any defined tendencies within the field of photography, but then I’m not really in touch with the field. I think, however, that a project such as Angle plays an important role in pointing this out, or the opposite. This is the third time they’ve launched a series of four books and I think the content of the books so far underlines my point. You find everything from straight documentary to staged and digitally manipulated works. There are perhaps no tendencies to locate now, or at least, not like the trends that were notable in the 1990s and before. The field is more decentred now: artists work in a wider spectre of materials; not so many devote themselves to one craft anymore. Skylstad: Is there a photography scene or stage? If there is, it's quite small – even smaller than the painting stage, which says a lot. Photography as contemporary or fine art is struggling with its self-esteem right now, and when it mimics abstract painting I get dizzy. Angle isn’t contributing to this, but more, correcting some errors when it comes to canonising the field. Just because artists are put into stables by their galleries doesn't mean they have to put on blinders, because we're not in a race, and if it is, it's a very long race where one races oneself. Angle 9°, Skallen, Katinka Goldberg, Angle 10°, Arituba Spa Center, Dag Nordbrenden, Angle 11°, Old Man 2015, Vibeke Tandberg, Angle 12°, Sighs shuffled, Kristian Skylstad.